The juvenile literature in the Southwest region of Vietnam is now encountering various serious challenges, ranging from insufficient quantity, lack of regional specific features, to professional attitude among writers. It is hoped that the upcoming Third Can Tho Book Fair would help authors of children literature reflect upon their work to meet the high demand of the market. Author Vo Dieu Thanh in a book signing session in the Second Can Tho Book Fair. Photo by Van Thanh Le. Lately, many publishers have introduced certain products aiming at the juvenile group. 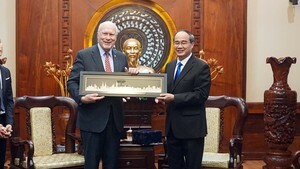 Kim Dong Publishing House, for example, published the book ‘The Orphan Stork’ by Nguyen Thi Thanh Hue and ‘Field Duck Leader’ by Le Quang Trang. These are fairy tails about animals, yet they elegantly demonstrate the lifestyle of people in the Southwest watery region of Vietnam. Another notable publication recently has been the series ‘Let Daddy Tell You..’ by Tran Tung Chinh from Women’s Publishing House. The books in this series, written in simple easy-to-understand style, deliver moral lessons to children. 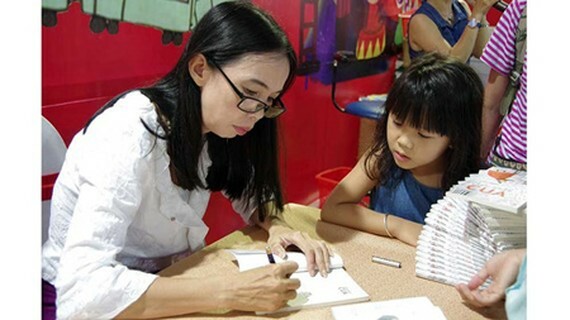 Writer Vo Dieu Thanh, famous for juvenile literature in Vietnam, owns several children works like ‘No Entry to Bim Citizens’, ‘Sun Children’, ‘We Fly All Over the Sky’, ‘Crab Superman’, or ‘Money of the Tree God’. Although Vietnam has a large number of authors for juvenile literature, young writer Le Quang Trang commented that this field in the Southwest region has not witnessed much development, especially when comparing to the past. According to author Tran Tung Chinh, the juvenile literature in this region lacks passionate writers. In addition, if existing, children books are merely impromptu works of authors, and hence a shortage of quality, he commented. This sadly leads to the uninterest of readers, strongly discouraging those authors. Mr. Chinh shared that normally a product for children is a break of writers between times to focus on more attractive works for adults. This means these authors do not truly form a serious long-term plan concentrating on the juvenile, but only recalling their own childhood memories. Therefore, a lack of contemporary topics among these books is unavoidable. In order to amend the situation, author Le Quang Trang suggested that there should be competitions with worthy awards and support from the public so that juvenile literature can prove its spiritual role and value among readers. He added that the promotion task was also critical to popularize literature products to their targeted readers. Also, author Vo Dieu Thanh shared that the cursory promotion campaigns and the lack of meaningful feedback from readers seriously dishearten many authors. The strength of Southwest region juvenile literature lies in the richness of writing resources, coming from people’s lifestyle as well as the watery scenery and the mysterious secrets from the past or the footprint of contemporary topics. Children in this region when reading these books will find themselves somewhere in the story, while the young from other regions have a chance to experience something interesting and exciting. Sadly, the current status of juvenile literature in this region demonstrates a much needed effort from both authors as well as the public for the heyday to come back.